Clean the meat very well and make it medium size. :- Do not cut it into small pieces. It has to be little bit bigger pieces. Marinate the meat with salt, turmeric powder and chilly powder and keep it for 15 to 20 minutes with little bit of water. :- Usually 3 whistles are enough. Cook the rice with 1 teaspoon rose water, required salt, cinnamon sticks, cardmom, cloves and ghee. 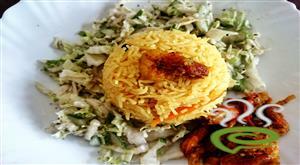 :- You can also fry the rice for some time and when it becomes kind of crispy cook it with water. The water quantity is 1 and half cup water for 1 cup rice. Frying the rice is optional. :- Make sure you have put enough salt. You can taste at a later stage and add it if it is not enough. When the rice is kind of done switch it off. 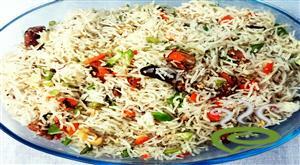 :- If the rice is not cooked you can add some more hot water and cook it. Rice should not be 100% cooked. It must be only around 90% or less. When you bake/dum the rice will get cooked well. Fry all the onions in a vessel with 2 tablespoon ghee and mix enough regular oil to fry it deep (kind of golden color). :-Do not burn the onion. Keep it aside. This will be used for garnishing and masala preparation. 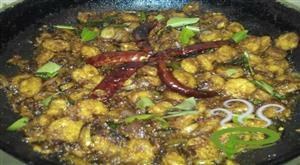 Fry pieces of cashew and raisin on the same oil. :- Do not burn it. Keep it aside. This will be used to garnish the biriyani. Grind the green chillies, ginger and garlic. :- Do not make it a paste. Grind the coconut, almonds and cashew with some water and make it a good paste. Heat oil in a big thick bottom vessel and put the above grounded green chilly mix to the vessel and saute it well. When the raw smell starts add tomato into the vessel and saute well. The tomato becomes fluffy put the coriander leaves and mint leaves to the vessel and saute it well until it mix well with tomato and cook well. Mix the curd and cook it for 5 minutes. Now put the 70% of fried onion to the vessel and saute well. 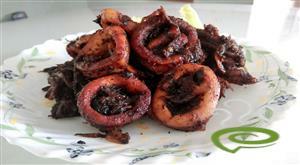 :- Make sure onion does not get cooked too much and becomes like a paste. 15)Add the coconut/almond/cashew paste into the vessel and add salt as required. Add garam masala and mix it well. Add the cooked meat with the left over gravy water. :- If there is lot of gravy left do not use the whole thing. Masala cannot be too much watery. It should be only enough to mix with the rice. Now split the rice into 2 equal portions and mix rosewater and color. Remove half of the masala from this vessel and put the first portion of rice in that vessel and spread it. Then pour little lime juice, ghee 1 teaspoon, add some pineapple, then color with rosewater and a pinch of garam masala on top of it. Now add masala with meat on top of the rice and add the rest of the rice on top the masala and repeat the pineapple, lime juice, color with rosewater, then put then spread the cashew/raisin/fried onions and ghee and a pinch of garam masala top of it. :- You do not have to finish the whole color mix. Just put enough to get smell and color. Use a long spoon and mix it little with meat and gravy. You just need to make holes here and there and just shake it. Don't mix it too much. Now close the vessel with a lid and cover it with a foil make it very tight. Keep the vessel in the over for 20 minutes on bake mode around 350 degree or so. If you dont have oven, put the vessel on a light flame and keep it for 15 to 20 minutes. 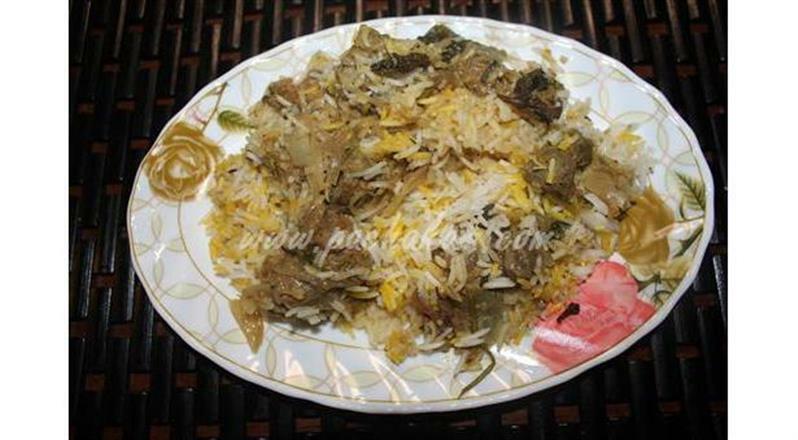 :-Restaurant Style Mutton Biryani is ready!!! 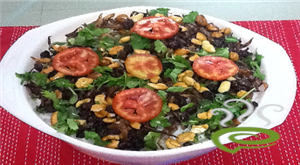 :- Serve the mutton biriyani with pappad and salad. 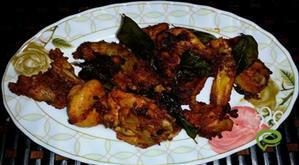 : This recipe is mix of Thalassery and Cochin preparation. 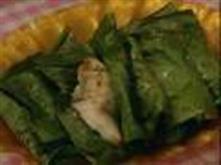 Excellent recipe, We tried and it came out very well, Yummy!.... But one small suggestion : Garammasala Mix: ratio of Cinnamon:cardamon:cloves:jathi pathiri:Aniseeds would be really helpful. My husband who is a beef specialist and a foodie slept in the kitchen for 2 days till the biriyani got over! He even washed the vessels so that I will make it again! It was truly worth the time spent! Edwin Crow@Laila Menon, Your husband took 2 days to finish the biriyani?? Wow.. you/he really had cooked a lot of biriyani then..
Super.....dish.I tried and it went on well. Delicious one.. i tried. Really superb!!! Superb recipe.......hats off to you! !tried it..came out too well!!!! First time in life, am cooking beef biryani. It took me 1.5 hrs to prepare.. I tried this and came out well. Thank you.. Excellent biriyani! This turned out to be the best biriyani recipe. It takes extra fifteen minutes but the taste was superb. This is an excellent recipe. Even though it takes extra time, worth it.